Only 9.9mm in depth, the YP-P2 showcases an expansive 3″ widescreen for great viewing pleasure. Its high resolution screen displays 30 frames per second in DVD movie format 16:9 screen ratio, for seamless video playback. The Samsung YP-P2’s touch screen is SAMSUNG’s most intuitive, innovative and user-friendly to date. Icons dance across the screen as you glide your finger up, down and across the screen. For your convenience and ease of use, dedicated hot keys playing the music and controlling the volume are on the side of the device, preserving the sleek design of the screen. Available with 2, 4 and 8GB NAND flash memory, the multi-functional Samsung YP-P2 is compatible with a variety of file types for music, photo, video and text media. In addition, the Samsung YP-P2 is equipped with a built-in FM radio. Touchscreen interface – interactive display makes the Samsung P2 very easy to use, and a choice of three styles of interface puts the user in control of how they use their P2. 3″ widescreen 480 x 272 LCD display – The Samsung P2 has a screen built for video, bright and sharp and ideal for 16:9 Music videos and films. Sound Quality – DNSE 2.0 for superior sound quality, so it can be reproduced the way it was intended through sound personalisation, user equaliser setting and bass extension. 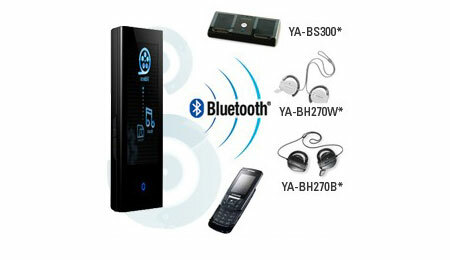 Bluetooth 2.0 – implemented allows two sets of headphones to be paired with the Samsung P2, with A2DP and AVRCP – remote control via Bluetooth. Please plan to play a video game to introduce ancestry.